It is always great to hear back from our clients:) This senior client came into the clinic with Plantar Fasciitis and a Heal Spur and was treated with Active Release Technique and Shockwave Therapy. I have finally remembered to send you a note to bring you up to date on my left foot. 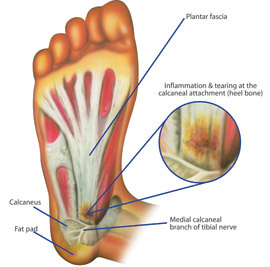 You treated me in the Spring for plantar fasciitis & a bone spur using the Shockwave Therapy. I can’t believe how good my foot feels now. In May & June I would feel some tingling & little jolts in my heel most days but I kept up my walks and by Summer I actually forgot about my foot totally! We had an extremely busy & physical summer when we moved our 40′ trailer to a new park including my 6 large shrubs. We had to landscape along with building garden sheds, trimming trees, shoveling river rock, etc. and all through it my foot never bothered me (other than just being tired). We got back to our long morning walks by Sept. and now that we are back in the City we are up to 6.5km most mornings until it snows, then back on the elliptical. I want to thank you so much for your help & treatments. You worked wonders and I will definitely be back to see you if I or my husband need A.R.T. or Shockwave treatment in the future. Having said that, would this type of treatment work for the arthritis in my toes?